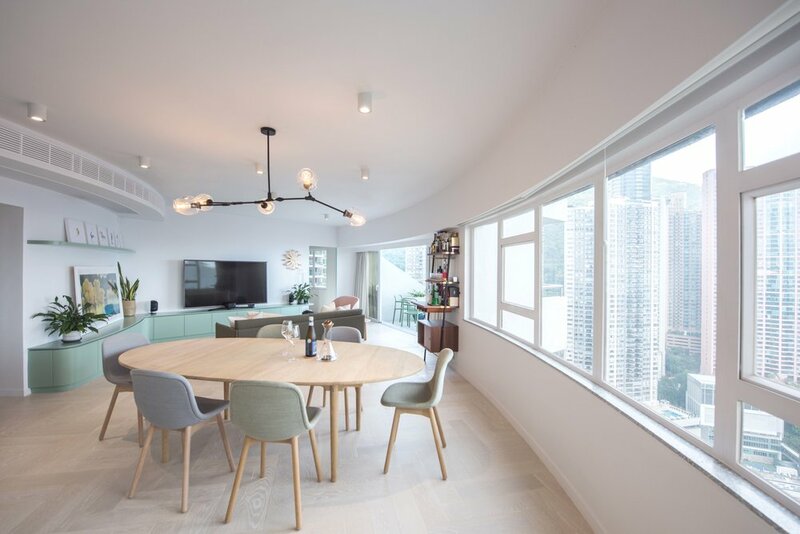 Bean Buro was commissioned to design this 2,040 sqft (190 sqm) apartment located at Century Tower 1 in Mid-levels for a young family of 3 with two toy poodles. The challenge and advantage for this project lies in the shape of the structural shell as the building is completely circular. The layout was tailored to embrace the shape of the tower, utilizing to its best the glass façade to open up views in every key spaces of the apartment. The plan opens up like a paper fan on which each space is carefully drawn, radiating towards the exterior allowing plenty of natural daylight in. A long curved corridor serves as a connecting point to each room. A second layer of circulation is introduced at the window side of the layout, allowing the spaces to flow and increase light penetration. A balcony serves as a space for enjoying fresh air while having breakfast or taking a break in a comfortable natural setting, surrounded by greenery. In addition to a spacious living and dining area, the program for this project included a master bedroom for the young couple, a study and a bedroom for their young son. The couple wished for the kitchen and dining areas to be moved to the North side of the floor plan so that they could enjoy and share the best view offered from the apartment. There, Bean Buro created a large open space where the couple can entertain up to twenty guests or just relax and spend time with the family. A semi-open kitchen is separated from the sitting room via a set of sliding glass doors that allow the family to instantly create more privacy while still enjoying natural light and exterior views. 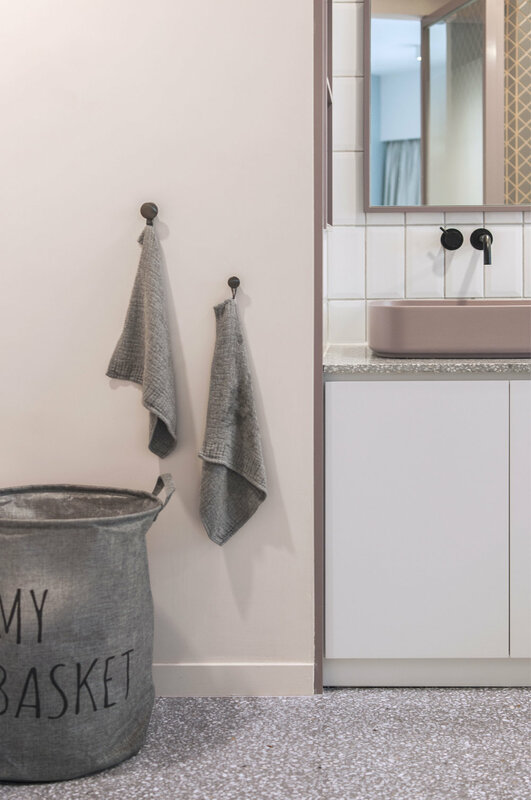 A variety of colours and materials are used to define the different areas throughout the apartment; Architectural surfaces of greys, blues, and taupes, while furniture and other details are highlighted using pops of green and pink. As the family planned to settle and grow, one of the challenges was to create flexible rooms that could be easily converted if the family welcomed a new child and adapted as their son gets older. To respond to these criteria, Bean Buro created a flexible double room connected by a large sliding door. These rooms are currently used as their son’s bedroom on one side and as a study on the other. 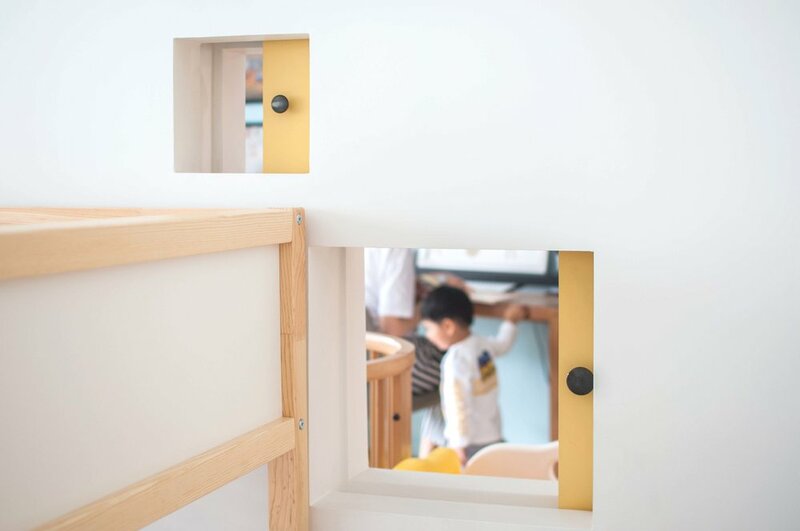 Playful sliding pocket windows are integrated for the child to keep a connection with his parents and future sibling at all times.